In this edition of PlayStation VR Conversations, we talk to Will Lewis, the Community Manager at Reload Studios. 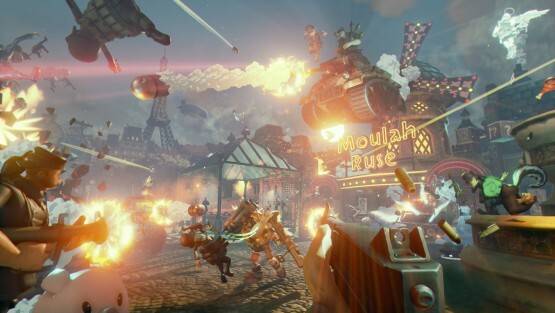 Reload Studios is currently working on bringing their first-person shooter World War Toons to PlayStation VR, and has former Call of Duty developers behind the project. Find out below how World War Toons is enhanced by being on PlayStation VR, and what Reload Studios has in store for gamers. PlayStation LifeStyle: What are the additional challenges in developing a game that uses virtual reality? Will Lewis: A lot of the limitations come from the hardware. Since this VR generation is just getting started, a lot of factors such as performance and viewing angles are still being developed and haven’t been perfected yet. Since we’ve decided to create a FPS in VR, there are a lot of things that we have to rethink. One example is the HUD that most traditional FPS games use. We found that this can be distracting to the player and potentially cause them to feel ill. As such we have removed it and work on new techniques to inform the player of what is happening in the game. One example is instead of an ammo counter. As a player fires the color of the bullets will change from red to blue based upon how many bullets are left in the clip. PSLS: Is virtual reality the next step in evolving the medium of video games? WL: Absolutely. We’ve been stuck with the basic controller/tv setup for decades now. This is the first time that we’ve been able to break through that barrier and truly immerse gamers into the games they are playing. Shadow of the Colossus was an amazing game, but can you imagine looking around as you climb these giants? It would be an unforgettable experience. PSLS: Do you feel that to make the best possible VR experiences, a game has to be developed from the ground up for VR? Or do you believe that current games can be adapted? WL: Absolutely. The biggest part is that you have to think about performance issues (at least with the current gen VR games) from the get go. Optimization from the start is the key and you have to make sure to have your content run lean as possible to hit performance benchmark to ensure best experience for users. After that, you have to make sure the design direction as well as game design is factoring in total immersion experience allowed in VR. How much you can turn around the corner, speed of your jump, (as mentioned above) HUD availability… all these have to thought out first to work in VR. It’s not something you can build traditional game and start thinking about converting into VR. There are a lot of factors that would need to be altered but the biggest one is that most games have been developed to work on a 2d screen, and when you try to look around in a headset with a static screen it doesn’t feel good. The entire experience would have to be reworked. PSLS: How important is immersion to the experience, and making sure the game doesn’t break away from it? WL: Immersion is the whole point of VR. If you’re playing a game/watching a video in VR and you aren’t immersed then something is wrong. VR games should aim to take players to fantastic new places and let them experience it as if they were living in that universe. The good thing is that giving a user 360 degrees environments automatically expose them to immersive experience. So the question really isn’t immersion, but how comfortably users can interact with the immersive environment they are in. PSLS: How is World War Toons enhanced by Virtual Reality? WL: World War Toons was built from the ground up for VR so a lot of the things you’ll experience in the game are enhanced just by the headset. We do take different approach than 1:1 interaction experience. Rather, it’s VR or not, we are making a game first and we want to make sure it’s fun experience. Also, we are trying to work with users who are used to playing using controllers on a sofa. Not walking around in an empty room. We are approaching our VR gaming experience from these angles. Our VR and non VR version of games are identical. But the experience is vastly different on VR version. One example is we have blue jump pads which bounce players through the air across the map. When I jump on those I get the same feeling that I have at the peak of a rollercoaster. It’s exhilarating and a lot of fun to blast my enemies while flying high above them. Another good example is our class switch system. We have distinct attributes to our characters including height and speed. These are enhanced tremendously in VR. In 2D screens, it’s virtually impossible to sense height changes. But in VR, you really feel like you are growing 12” taller if you switch from regular to heavy class. PSLS: Do you think PlayStation VR will get the same amount of support as other VR devices such as the Oculus Rift? WL: With Sony and the PlayStation 4 being such powerhouses in the gaming industry, I don’t see how [PlayStation VR] couldn’t get the same amount of support. Gamers are ready for VR and we’re happy to be a front runner for this emerging technology. PlayStation VR Conversations is a recurring interview feature where developers talk about the learning process of developing for virtual reality, and the future of video games.